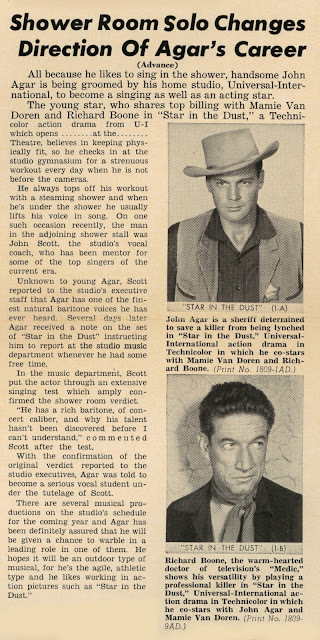 John Agar's big break at Universal-International. He'd been a bad boy, pulled time on an honor farm for over-drinking (then driving), and was said to have ill-treated dimple-darling of an ex-wife Shirley Temple. In short ... damaged goods, and doing penance in shlockers for U-I that led to rescue that was Star In The Dust. Could Agar fill Coop's High Noon boots? 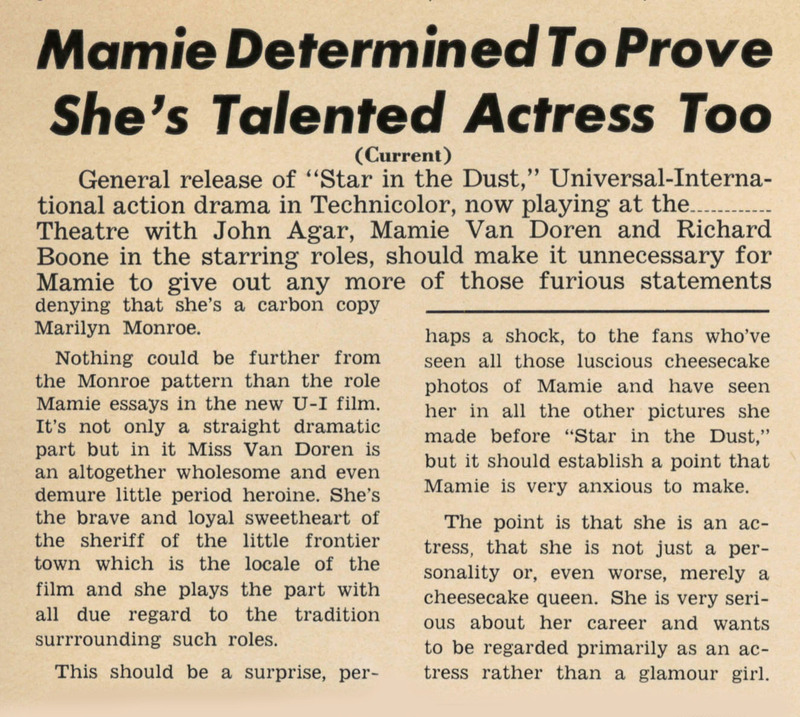 --- because Star was nothing if not a rip from that popular page, not a first, and far from a last, to ape aspects of the 1951 western game-changer. 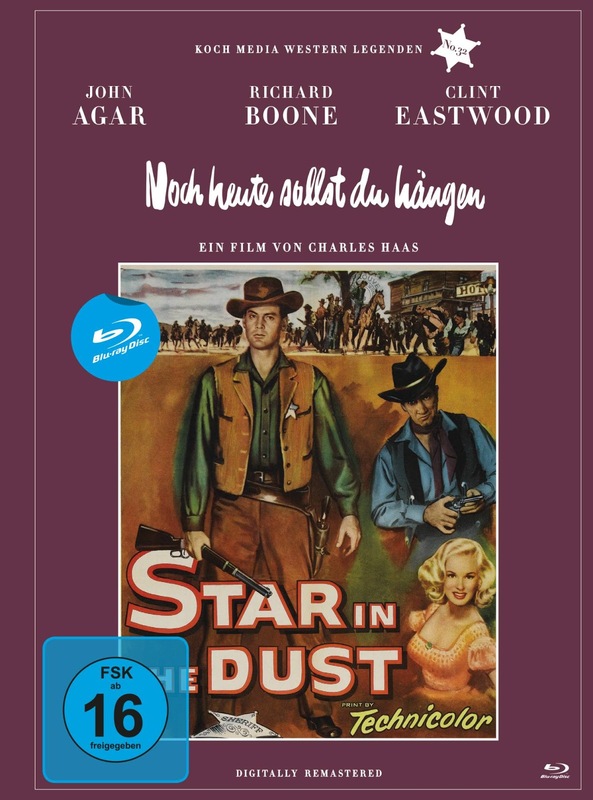 Star In The Dust is just out on Blu-Ray from Germany, sports a 2:1 ratio (too severe?, though framing doesn't seem over-tight), and the image looks great. All of Star was done on the backlot and Uni's western street, distance covered from Sheriff Agar's jail to the stable where heavies nearly hanged Bill Fields in My Little Chickadee. In other words, home away from home for ones who love U-I and trappings it (over)used. The yarn is this: Law-dog Agar has smiling (and intellectual) killer Richard Boone slated for the noose at sundown, but opposing forces want the latter lynched ... or set free ... depending on respective sympathies. Personal stories are thus woven, femme interest courtesy Uni lookers Mamie Van Doren and Randy Stuart, plus visiting Coleen Gray. 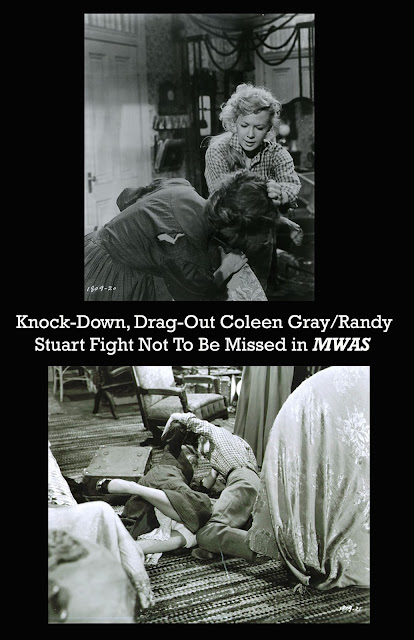 Randy and Coleen do a whale of a catfight at half-point, both scorning doubles. I'll bet the crew gave them big claps at the finish (I would have). Mamie earlier alights from a night's sleep with full make-up, cherry-painted lips, coifed hair --- I love unreality of comfort westerns. And here comes Clint Eastwood in an opener reel bit with Agar, which if nothing else got him star billing on the disc cover, even though there was nary mention of the screen beginner in start or end credits of '56 prints. Ties with High Noon are rife. There's emphasis on a clock, Star In The Dust set from morning to dusk of a fateful day. 80 minutes don't drag, suspense maintained nicely so long as your demands are modest. R. Boone is splendid as proposed rope-bait, and yes, he steals scenes from all of Uni's humbler talent, but that's no slam on Agar, who acquits fine as tin-star lead. I'm for putting paid to "Sgt. Jack" (Shirley's derisive label for Agar in scathing memoir account of their union) as lead apostle for 50's bad acting. He seems engaged, underplays commendably, and was real asset to all those U-I weirdies for which he's better known (would you have anyone else topline The Mole People or Tarantula?). Also to Agar credit was fact he never trashed his sunk marital ship Lollipop, even as Temple's book made him out a lothario, if not Lucifer, during years they were wed. Give Jack points, then, for being a gentleman in addition to fine and workmanlike performer. U-I's have been, in error, referred to as B westerns. It's a same fallacy applied in hindsight to Touch Of Evil, also from U. 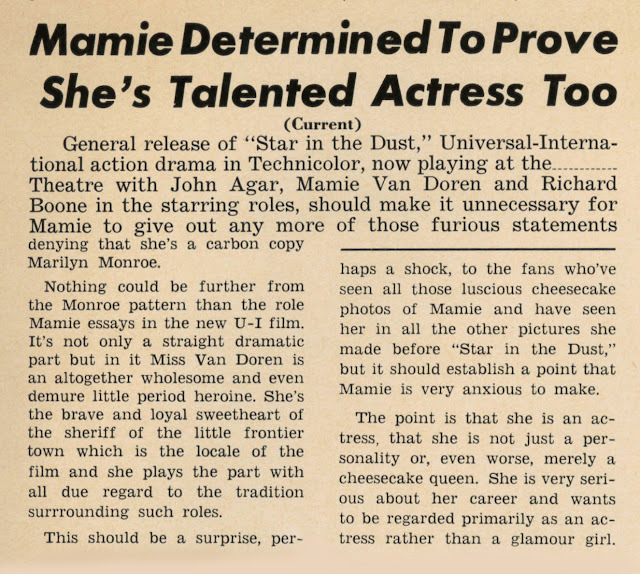 Fact is, Star In The Dust played top-of-the-bill in many situations, was in Technicolor, and certainly aimed for broad aud acceptance, if not critic kudos. Outdoor play-off would amount to much of Star exposure, these westerns, done by truckload at U-I, a drive-in's bread-butter in tandem with one another or action subjects supplied from elsewhere. Who knows but what one might break out and become a year's sleeper? That had happened before to smaller westerns. I'll acknowledge director Charles Haas (who he?) as no Anthony Mann or even Joe Pevney, but all industry folk had to eat, and maybe Haas had kin on the lot. Anyway, his helming is functional and overall OK. Star In The Dust's title is a misnomer, by the way, as Agar's badge does not finish underfoot as did Coop's --- does my reveal count as a spoiler? This one has gone unseen for too many years in the US (has anyone shown it? ), so looks like Region Two is an only recourse. Highly recommended in any case, Star In The Dust is a peach of a sage-set show. and Pa Kettle set scream "EIN FILMS VON CHARLES LAMONT!!!!!!" Snooze Fest. Terrible western that wasted an opportunity to focus on an interesting villain (Richard Boone) instead of the incredibly dull goings on that Agar and the rest of the cast were subject to. 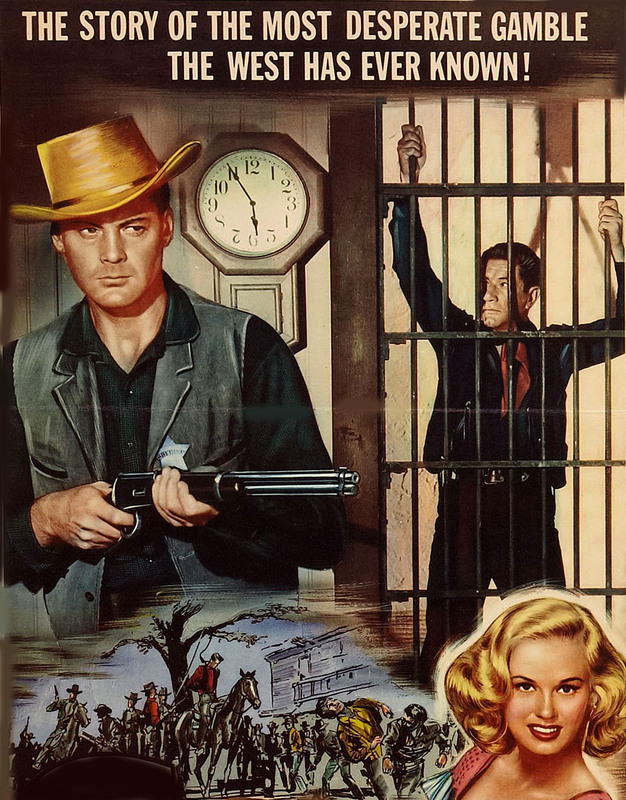 U-I did far better with the Audie, Rory Calhoun westerns. Charles Haas' direction is sensational! STAR IN THE DUST is a triumph of style over content if ever there was one. while the central image has two old geezers testing the newly erected gallows. a tree while Agar strides into the frame in sync with Gilkyson's lyrics. to playing a sheriff so hell bent on hanging a man. Haas' SHOWDOWN AT ABILENE is even better. returns and is re united with his former sweetheart Martha Hyer. Martha is now engaged to Lyle Bettger. Bettger and we just watch his face freeze in the mirror's reflection. Charles Haas certainly had something and the Koch Blu Ray is a beautiful transfer. two films no trash addict will want to be without. that show off Haas' great sense of widescreen composition. Thanks for these very interesting observations, John. Maybe it's time we all gave Charles Haas a closer look. just that some of his few features are interesting at least. These films score big marks for sheer audacity! earnest Mickey Rooney being about a foot shorter than heavy Dan Duryea. I have never seen GIRLS TOWN but want to very badly. Glad to see this one get some attention. While it's not at the top if U-I's Western heap, it's certainly no slouch. While everyone seems to be raving auteuristically about Charles Haas, I find it amusing that no one ever seems to have a good word to say about the other name who is associated with the films involved, and that is Producer Albert Zugsmith. Despite having one of the great names that just cries out the stereotype of the cigar-chewing thuggish movie mogul, you find ol' Zugsmith's name on rather a number of surprisingly good genre titles of the late 50's: WRITTEN ON THE WIND, THE INCREDIBLE SHRINKING MAN, TOUCH OF EVIL, MAN IN THE SHADOW, SLAUGHTER ON TENTH AVENUE, HIGH SCHOOL CONFIDENTIAL, and the aforementioned Haas-directed titles (Heck, Zugsmith even produced the also-afore-mentioned PARIS MODEL which John found pretty entertaining). Haas without Zugsmith has a filmography as a mediocre television director for the most part, Zugsmith without Haas has some pretty darn good films to his credit, he must have had some taste, he even hired Orson Welles twice!